Apple will repair select Apple Watch Series 2 models that do not power on or have a swollen battery free of charge as part of a new service policy. "Apple has determined that under certain conditions, some Apple Watch Series 2 devices may not power on or they may experience an expanded battery," wrote Apple, in an internal document distributed to Apple Stores and Apple Authorized Service Providers on Friday and subsequently obtained by MacRumors. "Apple will service eligible devices free of charge," according to the document, numbered SN4534 in Apple's internal GSX portal. "Apple will authorize coverage for eligible devices for three years after the original date of purchase." The policy was issued in at least the United States, Canada, Mexico, and Europe, so it is likely a worldwide initiative where service providers are available. A swollen battery can prevent an Apple Watch from powering on or cause the display to burst open. Photos of the issue have been shared by customers in the Apple Support Communities and MacRumors forums in recent months, but the majority of the incidents are first-generation models released in 2015. Eligibility is limited to any 42mm-sized Apple Watch Series 2 models, including Sport, Edition, Hermès, and Nike+ variants, pending a visual-mechanical inspection, according to a companion document numbered OP1977. The warranty status of the Apple Watch does not affect coverage, the document states. This new policy does not apply to the original Apple Watch, Series 1 and Series 3 models, or any 38mm model. 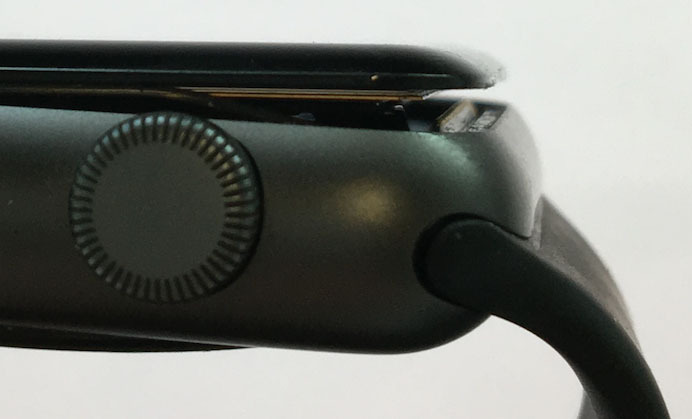 A few years ago, however, Apple enacted a similar policy for original Apple Watch models with swollen or expanded batteries that offers free repairs within three years of the original date of purchase. Affected customers can visit the Contact Apple Support page, select Apple Watch → Battery, Power, and Charging → Bring in for Repair to schedule an appointment with the Genius Bar at an Apple Store or at an Apple Authorized Service Provider. There are also options to contact Apple advisors by phone or online chat. Battery replacements are completed at an off-site Apple Repair Center. Apple advises customers inquiring about a refund for a previous Apple Watch Series 2 battery replacement to contact its support advisors. Apple has not announced this policy publicly as it does with some of its other repair programs, but MacRumors has verified the internal document's authenticity with multiple sources. However, outside of our control, some Apple employees advise customers that no such policy exists. In these cases, our only advice is to keep trying or escalate the case to a senior advisor if possible. I have a friend that had this issue but never mentioned it until his girlfriend just casually mentioned it when we were all out for lunch. The look on his face for being "outted" was priceless. He's the usual Apple diehard that will never let you know when one of his Apple devices has an issue. It Never surprises me anytime I run into an Apple users like this, that try to hide defects or any kind of problem they're having with their Apple device. I just don't understand this need to be so protective of this company. Lol. I had the same problem with a swollen battery with my iPhone 5s that wouldn't keep a charge and Apple made me pay the $79, then ruined the phone, sent it back with most of my apps disabled by not sending it back with the same IOS. Go figure. Which has absolutely nothing to contribute to the article topic. On a positive side, Apple extending the free repairs regarding the swollen batteries on the Series 2 demonstrates they at least acknowledge the issue. Good luck with your lawsuit. I have a gold out of warranty watch that refuses to power on. Reading these posts of people managing to get similar watches serviced makes me wonder if it's worth giving it a shot at a repair. I have moved on to a series 3 LTE Nike and series 2 Nike sport but I certainly would not mind having tj at gold one working again. This post right here demonstrates what's the problem is with a tech company coming out with a "watch"
Nobody's Omega, Rolex , TAG Heuer, Breitling etc refused to "power on"
Yes but nobody's Omega, Rolex, TAG Heuer or Breitling help me navigate turns and lane changes through unfamiliar territory, tracks my sleep, helps me track my activity, keeps me connected to important notices from my kids' school like road closures or detours between my house and the school, tracks the weather, the moon phases, my cardiac condition. That's just naming a few things. Maybe some of those watches can do a few of those functions or something else...but all of them? All in a package small enough to fit on a petite person's wrist no less. Lol, and I DO have some fancy watches that refuse to power on. Because their itty bitty non rechargeable batteries died. I also have kinetic and solar powered watches. But I got spoiled having a computer on my wrist. It's hard to go back to giving that wrist space back to a device that only tells me the time and date, albeit prettily. Also, why is Apple not being so public about this repair program? Seems like they don't want to repair these or want to keep it on the low for publicity purposes. What do you want them to do exactly? Apple is open about this repair policy in store, online chat or over the phone. If the customer has an issue with the watch, they very may well visit sites like these or contact Apple directly to find out more anyways, which would be explained to them. Other tech sites have reported Battery replacement concerns from Apple in the past from issued memo’s. Also, I highly doubt an expanding Apple Watch Battery would reach a major publicity level, this isn’t on a level that Samsung’s Note 7 was in comparison. Oh this isn’t good.... I thought this was an issue exclusive to the Series 0? I guess not... I hope my Series 1 isn’t affected. Pretty poor design if this issue affects multiple versions. Seems pretty poor that Apple cannot design a device where the battery does not swell when it gets old. I've had several laptops that have done that and have or nearly have ruined the hardware. You "think" only apple batteries swell? Why was this never an issue with the little button batteries used in older digital and quartz watches? Swiss and other quality lifetime watches have nothing to worry about afterall since they don't compete with disposable watches. Even Garmin sport watches have better quality.